Let’s be frank. Some visitors just don’t get Taos. Others fall in love at first sight. Taos is strange that way. The town speaks a different language to different people. Always has. Probably always will. 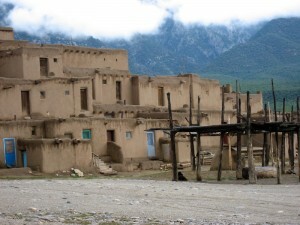 Both a National Historic Landmark and UNESCO World Heritage Site, the Taos Pueblo offers visitors a fascinating peek at the architecture and cultural life of an authentic Native American adobe pueblo that has been active for over 1,000 years and is considered the oldest continuously inhabited community in the United States. Hunter-gatherers left potshards and pictographs in the area over 6,000 years ago, and they were followed by centuries of assorted settlers, invaders, and occupiers all contributing pieces of their own civilizations. 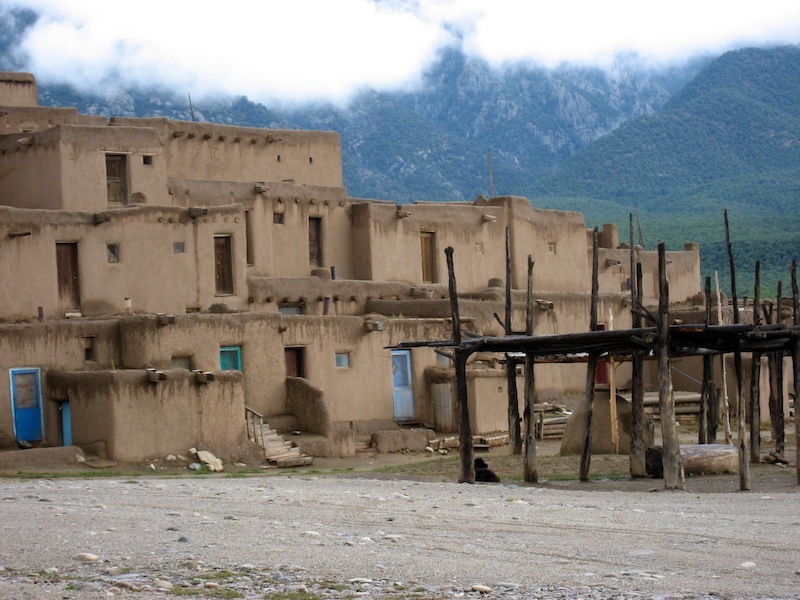 The mix and mingling of cultures creates a special atmosphere in Taos and increases travel pleasure for anyone interested in culture and/or history. Tao’s rich art scene started in 1898 when two artists stopped to fix a broken wagon wheel and decided to stay. The town has drawn artists and their entourages (dealers, collectors and educators) happily ever after. Kit Carson, Millicent Rogers, D.H. Lawrence, Mabel Dodge Luhan, Dennis Hopper and Willa Cather are just a few famous individuals who shed their spirit on the town. 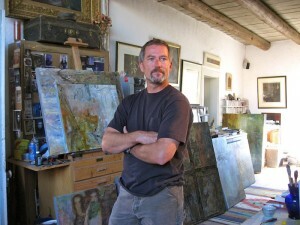 Their books, art, films and other work shine light on Taos and Taos spotlights them. 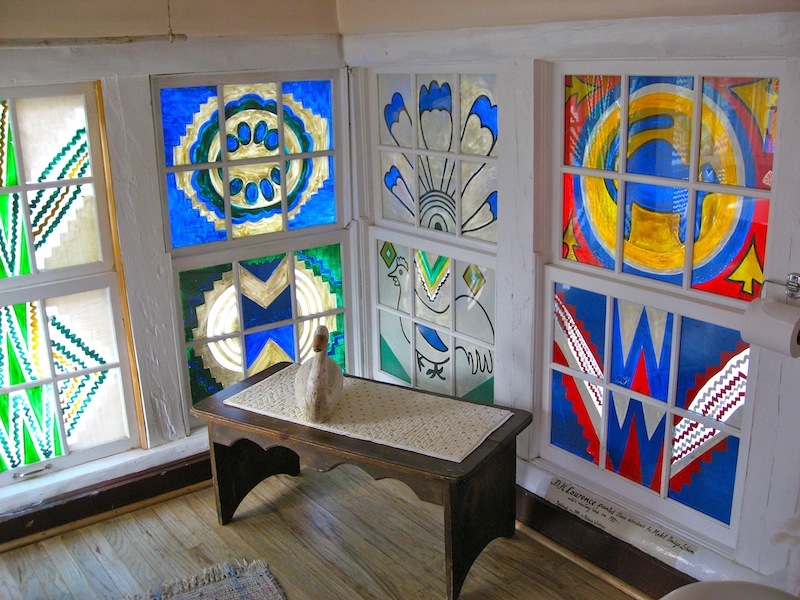 Lawrence painted Mabel’s bathroom windows because he felt “exposed” without curtains. The prude. 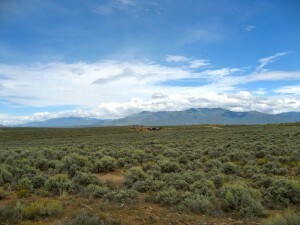 With an elevation of approximately 7,000 feet, on a sweeping desert mesa flanked by one of Northern New Mexico’s highest mountain peaks (Wheeler Peak), deepest gorge (Rio Grande Gorge) and loveliest forest (Carson National Forest), Taos offers a plethora of high-desert delights including postcard-perfect scenery, pristine air and dazzling, painter-pleasing natural light. Whitewater rafting in spring, hiking and biking in summer and fall, skiing in winter—stay in Taos and enjoy sports for all seasons. Collectors of contemporary art and Native American crafts find treasures in the town’s unique shops and galleries. 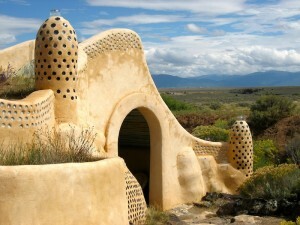 Taos is not only headquarters of the Earthship community, but also the place to see a large collection of the “radically sustainable” homes that take self-sufficiency to an ultimate level. Both weird and wonderful, Earthship buildings are constructed with natural and recycled materials (such as earth-packed automobile tires) and function independently off the grid, not needing to rely on public utilities. 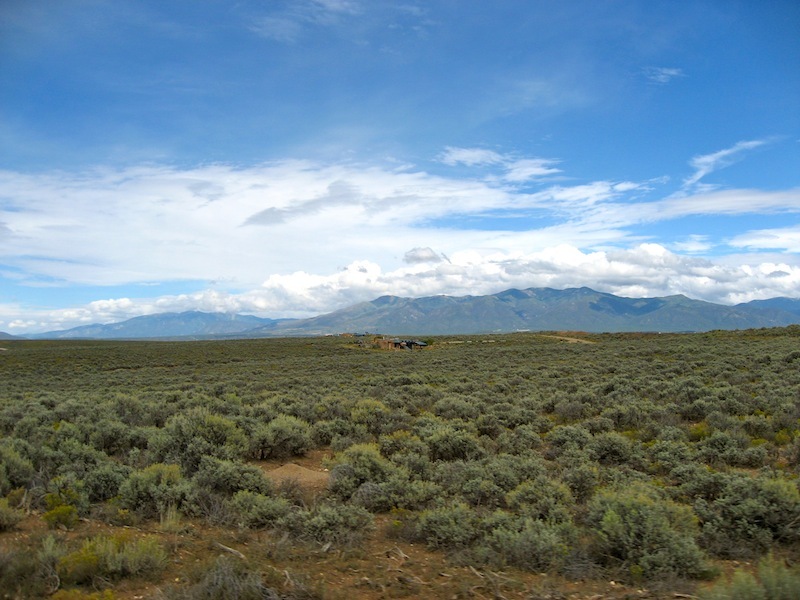 When it comes to great places to stay, Taos supplies a broad choice ranging from homey B & Bs to top luxury resorts. My three personal favorite properties sit on Kit Carson Road, a short distance from each other and from the heart of town. Converted from a 1950s motel to a 12-rooms B & B, the Inn on the Rio wins accolades for its casual, comfortable ambiance, charming, hospitable owners and terrific breakfast. Good prices, easy parking and one of the few outdoor pools in Taos add to the draw. Owned by Taos natives, Casa Benavides attracts “insiders” such as visiting artists and relatives of locals. The 39 rooms, located in several historically important buildings, differ as to decor and features, and an online matching system helps travelers fine the right fit. (I like the Anasazi room—but then, who wouldn’t.) I also adore the extravagant buffet of home-baked goodies set out, free of charge, for guests every afternoon. El Monte Sagrado manages to combine environmentally sound practices with enticingly comfortable luxury. The lushly landscaped four-acre “eco lodge” includes two restaurant, a spa, a gift shop, a conference center (great for weddings) and 84 uniquely designed rooms/suites packed with amenities (fireplace, soaking tubs, original art, etc. etc. etc.). This is the place for guests who appreciate high style as well as rich substance. Mexican, New Mexican, Italian, French, all-American, casual, elaborate… Taos has all tastes covered. 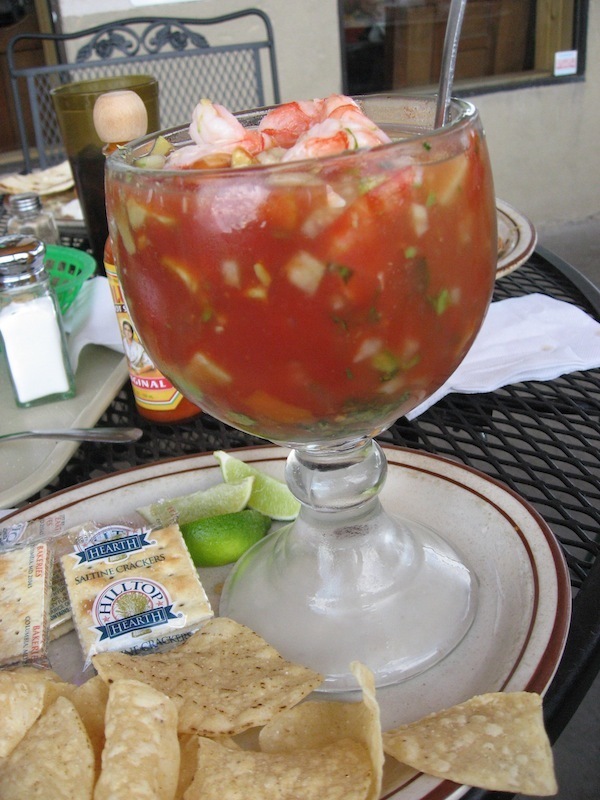 Although many places fall into the not-to-miss category, Guadalajara Grill heads the list as a favorite local hangout. In fact the super casual restaurant is so popular, it has two outlets in town, and both serve a fantastic shrimp cocktail. Combine Clamato juice, ketchup, lime juice, tomato, cucumber, onion and cilantro in a non-reactive bowl; stir well. Add shrimp, avocado and salt to taste. 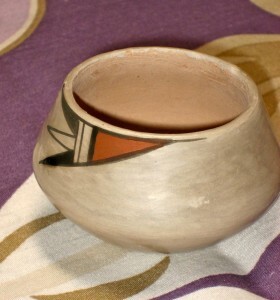 Cover bowl and refrigerate 2 to 4 hours. Serve chilled, in a fishbowl glass, with crackers or tortilla chips. Pass wedges of lime, chopped jalapeno pepper, chopped cilantro and hot-pepper sauce.